The Body Coach Joe Wicks has 2.5 million Instagram followers, has sold three million books, and had a series on Channel 4 - and now has two new roles - as dad to six-month-old daughter Indie and husband-to-be. Joe is equal parts fitness powerhouse and family man trying to find balance between work and home life. Looking forward, Joe is due to get married sometime this year, and is bursting with positivity about daughter Indie’s foray into food, whilst working on a children’s cookbook he’s co-writing with a nutritionist. Read more of Happiful's interview with Joe Wicks in issue 24, on sale now. Visit the Happiful shop to get your print copy or read free online. 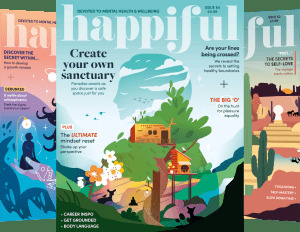 For more information about Happiful, images and extracts please contact Amie Sparrow, PR Manager, amie.sparrow@happiful.com.